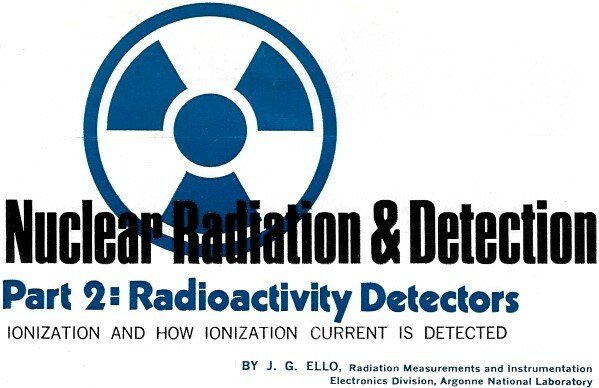 Part 1 of this 3-part series discussed the basics of radiation, and now author Ello delves into various methods of detecting and measuring radiation levels. Ionizing radiation measurement capability is needed for the safety of life forms due its ability to knock electrons away from their host atoms, thus generating ions that cause molecules to form that might not otherwise do so. If those molecules happen to part of a self-reproducing living cell, then a mutant - or cancerous - cell is the result. With luck, body defense cells will hunt down and kill it, but if not, a tumor will develop - maybe benign, but maybe malignant. 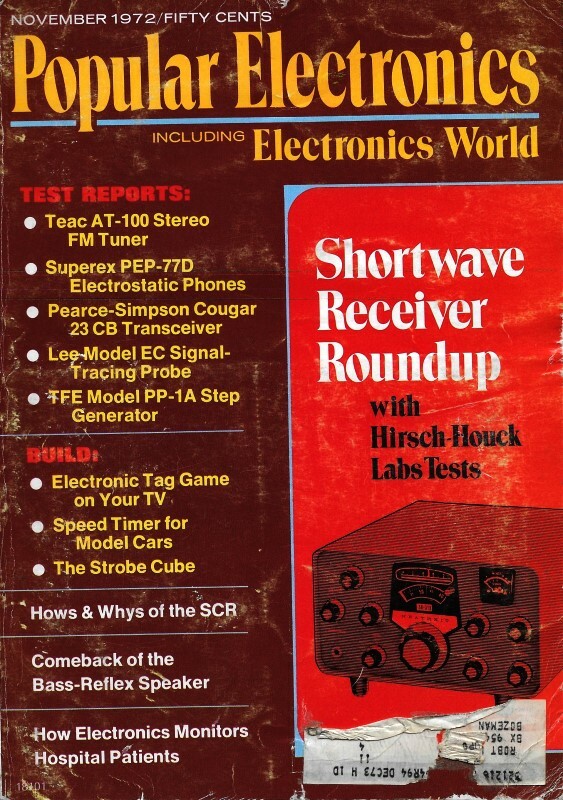 Parts 1 and 3 of this series appeared in the October and December 1972 issues, respectively. In Part 1 of this series, the various types of radioactivity and the behavior of each were discussed. Before getting into the details of radiation detection, the topic of Part 2, a review of the characteristics of the three types of radiation is in order. In Part 1, it was stated that the alpha particle's large mass and high velocity contribute to its good ionizing power. Because its penetrating power is weak, the alpha particle is easily absorbed by a few sheets of newspaper. And, being a particle with a positive charge, it can be deflected in a magnetic field. The beta particle has more penetrating power and achieves a greater velocity than the alpha particle. Because of its negative charge, it can be deflected in a magnetic field, but in the opposite direction to that of the alpha particle. The beta particle has less ionizing power than the alpha particle, but its penetrating power is greater, a thin sheet of aluminum or Lucite being required to absorb the particle. Fig. 1. Ion-pair production is the result of alpha particle striking atom. Because they are electromagnetic waves - not particles - and without an electrical charge, gamma rays cannot be deflected in a magnetic field. Gamma rays travel at the velocity of light and are highly penetrative. It may take several inches of lead or 3 or 4 feet of concrete to absorb them. Of the three types of radiation, the gamma ray has the least ionizing power. Ionization. When it passes through matter or gases like air, nuclear radiation produces ion pairs. 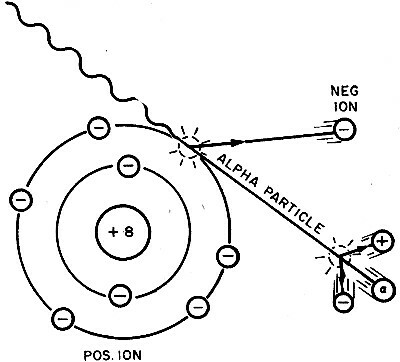 The manner in which ion pairs are formed by an alpha particle colliding with an oxygen atom is shown in Fig. 1. The electron dislodged by the alpha particle becomes a negative ion, while the remainder of the atom, now minus one electron, becomes a positive ion. Note that the collision forms two oppositely charged ions; hence the term "ion pair." The alpha particle continues to produce ion pairs until it has lost all its energy through collisions. The process may result in more than 100,000 ion pairs in a cubic centimeter of air. In a similar manner, a beta particle produces ions, but only at a rate of about 300 ion pairs per cubic centimeter of air. Gamma and X rays which are not particles also produce ion pairs, but in a slightly different manner. Gamma rays can eject electrons from atoms with sufficient velocity to make them collide with other atoms to produce ion pairs. The number of ion pairs thus formed depends on the energy of the freed electrons. Ion pairs made from neutral atoms move about in random paths until, through recombination, they eventually become neutral atoms again. However, if ions are produced in an electrical field, they are affected by the field. Consider a small chamber with one set of parallel plates (electrodes) on the inside. It is being irradiated by a beta ray source as shown in Fig. 2. With the power switch open as in A, no electrical field is applied to the electrodes. In the absence of an electrical field, the ions will recombine to form neutral atoms (as a result of the attraction of opposite charges). 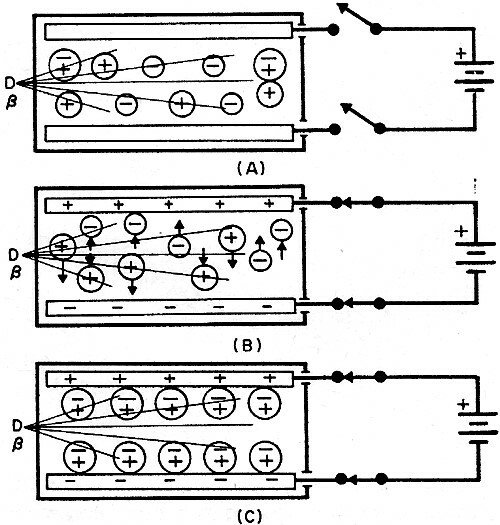 However, when the switch is closed as in B, an electrical field is generated between the electrodes. This forces the ions to move in opposite directions, the negative ions to the positive electrode and the positive ions to the negative electrode. Eventually, as shown in C, the ions become neutralized since the positive ions attract negative ions from the negative electrode and the negative ions give up their charge at the positive electrode. Fig. 2. Neutralization of ions is shown. Fig. 3. Ionization current measurement. Detecting Ionization Current. The basic scheme shown in Fig. 3 is an example of a radiation detector. Attached to the detector, in series with a sensitive ionization pulse current meter, is a power supply which can be varied from zero to some high voltage. The effect of the detector voltage on neutralizing ion pairs in six different regions is shown in the graph in Fig. 4. The three curves show that an alpha particle ionizes more atoms in its path than do the beta particle and gamma ray. Assume that the detector chamber which contains a counting gas (Fig. 3) is exposed to a radioactive source with the detector voltage set to zero. There is no electrical field to accelerate the ions which wander about and eventually recombine. Hence, no meter pointer deflection will be observed. Now, when a low voltage is applied to the detector, creating a weak electrical field between the anode and cathode, a small portion of the negative ions is neutralized or collected at the anode. However, slower moving ions have ample time to recombine before reaching the anode, and the pulse size is smaller. This partial collection of ions takes place in the recombination region on the graph. 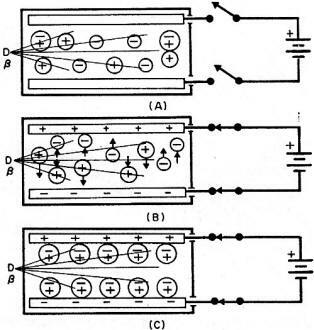 Raising the detector voltage increases the electrical field and accelerates the ions, lessening ion recombination and permitting more ions to be collected by the anode. By further increasing the voltage, a point is reached at which the ionization current is proportional to the detector voltage and all ions are collected as fast as they are produced. This occurs at the "saturation point" on the graph and places the detector operating characteristics in the ionization region. Any additional increase in detector voltage in this region will not increase the ionization current because only ions formed by the radioactive particles contribute to the ionization current flow in the detector. Beyond the ionization region (flat portion of the curve), any additional increase in detector voltage will result in an increase in detector ionization current. This is evidence that some new phenomenon is taking place within the detector. Since the voltage has been increased, the electrical field has been increased which accelerates the ions toward the anode at a much greater velocity. The negative ion, or electron, with its higher velocity, has enough energy to dislodge other electrons, creating additional ion pairs which contribute to the total ionization current. This secondary electron region is shown on the curve as the proportional regions. 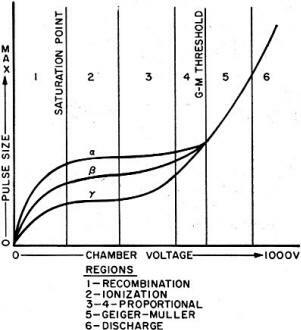 In the proportional regions, under ideal conditions, it is possible to differentiate between alpha, beta, and gamma ionization current pulses as shown on the graph. Instruments which use this portion of the curves are known as proportional counters. Fig. 4. 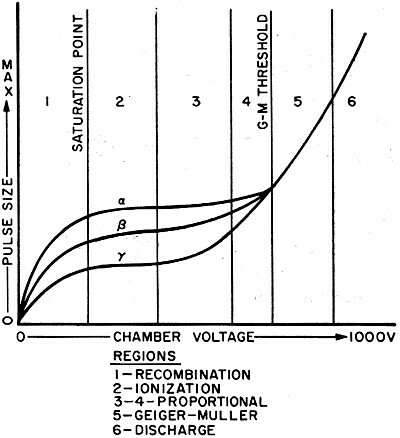 Chamber voltage vs. pulse size. In the Geiger-Muller region on the graph, the detector's voltage is increased to a level sufficient to cause an avalanche of freed electrons. For example, one alpha or beta particle or gamma ray will ionize an air atom with so much energy that a freed electron is capable of freeing another electron and these, in turn, free other electrons to create an avalanche effect. This electron multiplication reaches a point at which all ionization current pulses are equal in amplitude (G-M threshold point where all curves join to form a single curve on the graph). Radiological instruments operated in this region are known as Geiger-Muller survey meters. The last section of the graph is the continuous discharge region. Here, the detector's voltage is so high that once an ionization takes place, there is a continuous discharge of electricity like an arc across the gap between the anode and the cathode. Consequently, this region is of no use at all for detection of radioactivity. Next month in Part 3 in this series, we will discuss the use of the counting regions in various radiological survey meters.